When Camden Group needed to invest in new machinery to meet growing customer demand, Haffner Murat had the expertise and machinery needed. Dave Thomas, Managing Director of Haffner Murat, looks at the story of the multi-million pound project. Camden Group is the UK and Ireland’s largest independent supplier of PVC-U windows and doors for the domestic, social and commercial new build sectors. Its headquarters in Antrim, Northern Ireland, has manufacturing facilities located across 40 acres, including onsite recycling and extrusion plants. Yet even with facilities at this scale, the team at Camden could see that investment and further expansion was needed to ensure it would be able to keep up with customer demand and planned growth. It called us in to help. We are renowned in the industry as machinery experts. We supply the machines that enable fabricators of all sizes to grow. Equally as important, we also have the expertise and understanding of the industry needed to help our customers maximise the value of those machines. Camden’s initial focus was on its door factory. It wanted to create a fully automated factory that delivered the output and quality Camden’s customers demand, even as order volumes increased. As in any business looking to maximise what automation has to offer, it isn’t just the shop floor that’s involved. We worked closely with departments at Camden including IT, Production, Maintenance and Management to ensure that all the efficiencies they needed were achieved. Central to the project’s success was our ability to tailor machinery to create bespoke options that deliver precisely what is required. We are the only machinery manufacturer able to offer this service. If this isn’t surprising enough, it’s also surprising that it isn’t a lengthy process either. Thanks to the skills of our engineers and state-of-the-art ways of working, bespoke machines for both aluminium and PVC-U fabricators can be designed and built within 12 to 16 weeks. At the heart of the door factory is the NR242 Profile Machining Centre. This is an undoubtedly impressive machine and is designed for large scale fabricators. All sawing, routing, drilling, reinforcement steel screwing, marking and end milling operations on PVC profiles are gathered in one machine controlled by a computer. It has two machining stations for profiles, is capable of stacking 10 profiles of up to 6.5 metres and has the ability to store 500 profiles. We reworked the machine to make it faster and more accountable in a new set-up that prioritises automation. All doors will be transported to each station without the need for manual lifting. Key operations with benches for self centering and auto positioning, drilling and screwing will remove the manual measuring and jig alignment element, resulting in accurate alignment on every door. 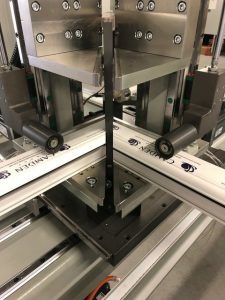 Other developments include automatic screwing units on the transfer bed and automatically checking each piece is accurate after each cut to remove the risk of errors. As well as upgrading the door factory, Camden has also added a new factory to its manufacturing headquarters to create capacity for additional volume. We worked with the team to provide bespoke machinery here too. The investment included the addition of several SMR-5 Five Head Welding Machines. It’s a machine that is already the fastest of its type on the market and adds value to the set up of any fabricator, no matter what the size. It welds corners/transoms and cruciforms on all heads and features include automatic head positioning, automatic support fence positioning and self-centering transom alignment on all heads. Working closely with Camden’s team to understand precisely what was needed, we took these abilities to the next level so Camden’s versions are capable of welding four squares a minute. These machines feed the SBA-4 Profile Machining Centres, SMR-4 Four Head Welders and Corner Cleaners. The investment will ensure every window and door is made to the highest standard possible and delivers full automation and quality control checking for cutting, welding and bead processing. It’s a set up that reflects the market-leading status of the company and demonstrates why it deserves its reputation as an innovator. We are passionate about automation’s ability to transform fabrication companies. We are also passionate about making sure companies make the investment that is right for them – our free consultancy service makes sure our clients will see maximum return on investment on their purchase. We are also clear that sometimes – as in Camden’s case – we need to create bespoke machinery in order to meet the objectives. No matter what a project’s scale or requirements, we are always proud to look back at a job well done. Founded in 1990 Haffner Murat are experienced machinery suppliers who really understand the fabrication industry and are truly committed to adding value to your business.